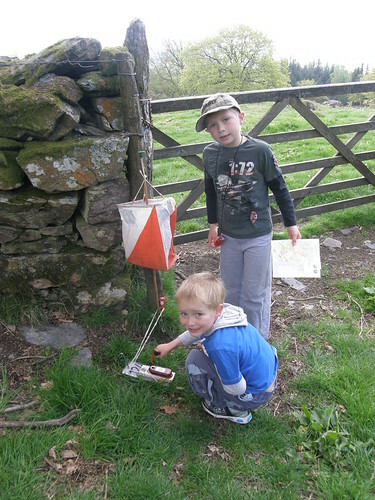 A and B seem to have caught the orienteering bug. We’ve been a few times now. 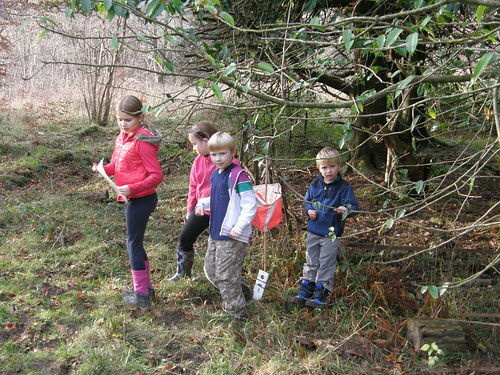 Just this month, B and I tried the National Trust’s new course on Sizergh Fell with his Beaver Scout unit. 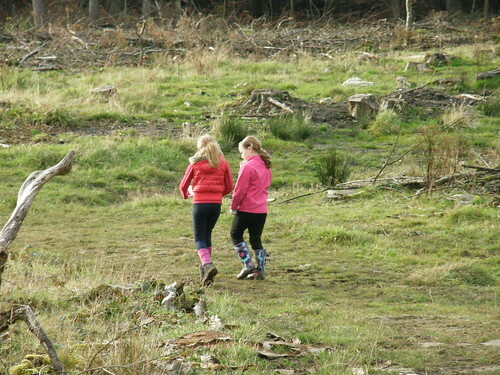 Then both A and B went for a training session in Eaves Wood with a friend who knows about these things. 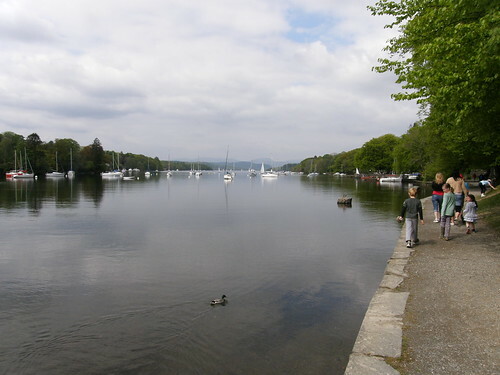 So when we discovered that there would be an event not too far away at High Dam, above Windermere, we were keen to have a go. Well, three of us were. TBH was under the weather and elected to stop at home. S just wanted to watch the telly. He moaned on the drive there. He moaned on the long walk to the start. But, fortunately, once we began he loved it. A wanted to have a go on her own, the boys were content to have me tag along, although I let B do the map reading. We all did the white course (a short easy course with all controls lying along a route connected by paths). Both A and B missed the fact that they should have gone through the gate in the photo above, rather then continuing to follow the path we had been on up to that point. By the time we bumped into her, however, A had realised that she had made a mistake and was heading back to this control to have another go. 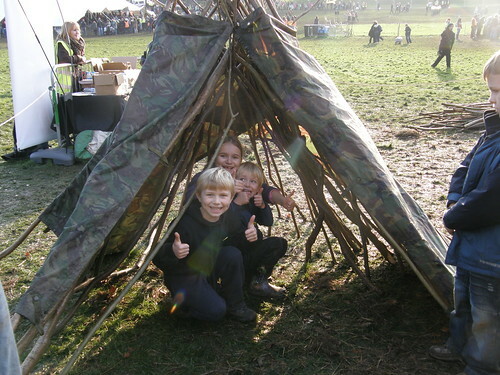 It was a relatively big event, there was food available at Finsthwaite House where the cars were parked in an adjacent field, and some of the kids friends were also there, so we stayed for quite some time after we had finished the route. We might then have gone to take a tour around the nearby Stott Park Bobbin Mill which I remember fondly from a visit many years ago, but it was shut. So we went around the end of the lake to Fell Foot park instead. The kids climbed and swang and were temporarily pirates on the extensive playground there whilst I supervised them carefully from a recumbent position. It was warm. The sun shone. How odd. 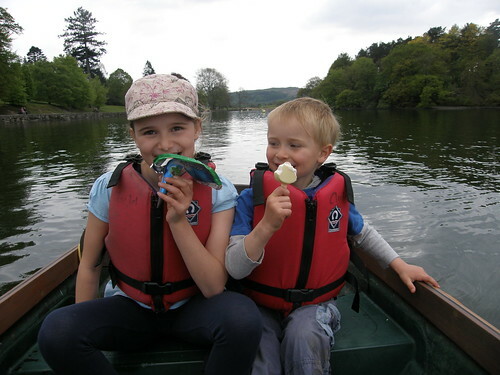 I must have been in some sort of shock – I forked out for both ice-creams and for a half-an-hour rowing-boat hire. 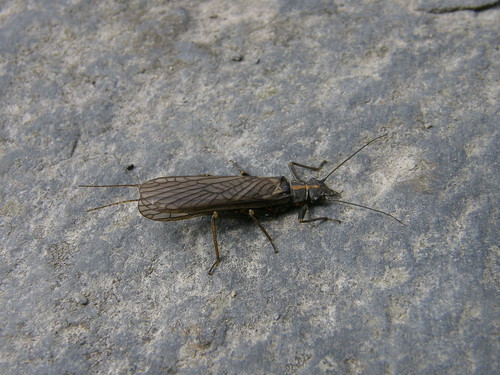 I think that it’s a stonefly, an adult female Perlodes microcephala. Stoneflies breed in water, in this case in stony streams. 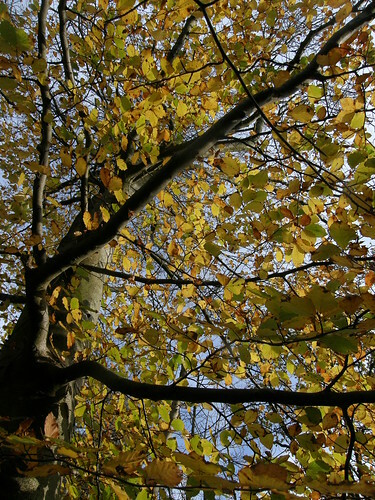 There are 34 British species. And the post title? 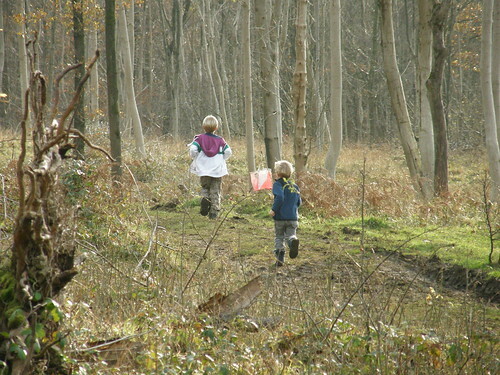 Well, it’s more Fun With Lists: the National Trust have a campaign to encourage kids to get outside and do…well the sort of stuff which is fun to do outside. I don’t like the idea of ‘Bucket Lists’, but I must admit that this one is quite fun. A went through the list and declared that she has 5 still to do. She has plenty of time. But you have to sign up to access the entire list and then cope with the unedifying, but completely inevitable, hedging of bets as lots of unnecessary safety advice accompanies the list. Not a bad list though. Any glaring omissions, do you think? 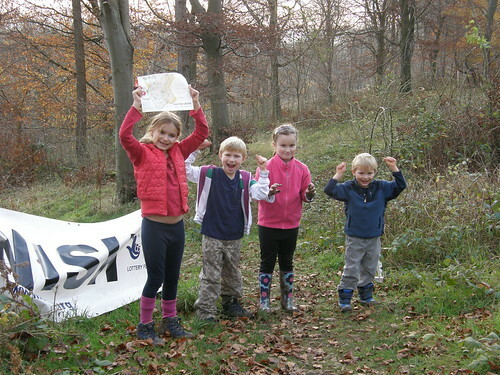 Anyway, the Dalton Crags event, organised by SROC (South Ribble Orienteering Club) was much more conventional. Dalton Crags is part of the Hutton Roof limestone ridge and the start was from the same car-park where S and TBH and I began our ascent of Hutton Roof back in August. We opted for the yellow course and the girls had soon taken charge of the navigation. The boys seemed happy to follow directions and race ahead to the next control. 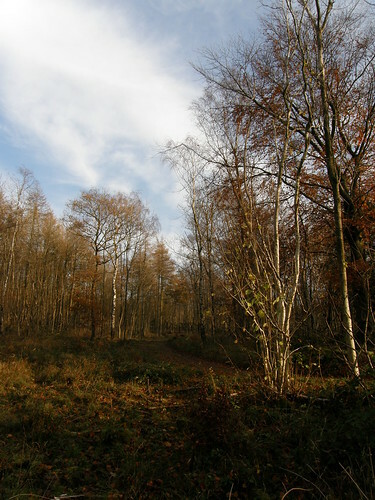 The route took us in and out of woodland. The limestone scenery is so complex in this area that the cartographer had invented his own unconventional symbols in an attempt to distinguish between the different areas of pavement, partially overgrown and otherwise. We finished in a not particularly earth-shattering time of just under an hour. We didn’t mind. In fact, if we’d finished in 18 minutes like the winner did, I would have felt cheated. M’s lack of enthusiasm here had a lot to do with the fact that 10 yards short of the finish she slipped and fell in a particularly muddy spot. The eagle-eyed amongst you may have spotted that in my last post I mentioned ‘days out’ plural, but that I haven’t posted about the second of those. I’m not sure that it belongs on a walking/natural history/castle obsessed blog, but for the curious…. 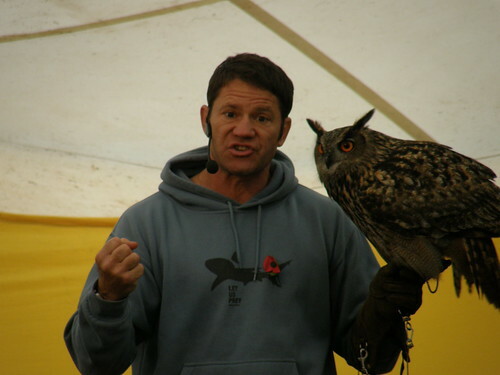 If you have kids of CBBC age you might know that this is Steve Backshall, presenter of Deadly Sixty, all-round action man and a huge hero as far as my kids are concerned. We went to Preston for a free Deadly Day Out courtesy of the BBC. TBH had organised the tickets before realising that she would be away and unable to attend with the rest of us. That was her story anyway. 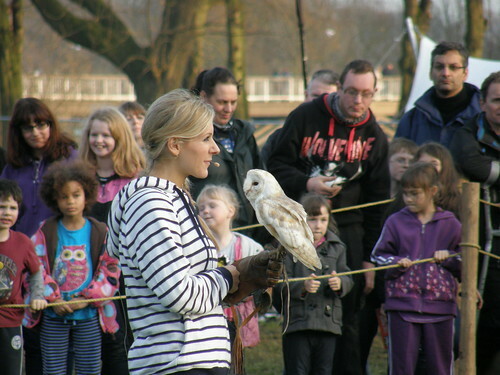 This is co-presenter Naomi Wilkinson with a barn owl during a falconry display which was part of the day’s events. I took a ridiculous number of photos of Mr Backshall and various creatures – if you’re interested, then they’re here. I have to say – his talk and question and answer session was most impressive – he really knows his stuff.